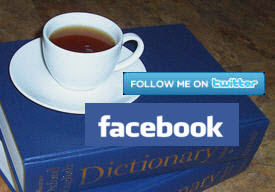 Message I got on Twitter: “OMG…u r my tea BFF!” Uh…okay…I think… What the heck is a “tea BFF”? I mean, a BFF (best friend forever) is easy to understand. How does tea figure into it? How do you become a tea BFF and, once there, what do you do? Time to find out. We’ve all heard of social media – sites like Twitter, MySpace, Facebook, and others. Through them we can connect with people we know and people we end up getting to know. So it has been with me. I have branched out to “meet” other tea lovers, cat lovers, book lovers, music lovers, movie lovers, and an occasional jewelry lover or two. The main focus has been on tea – sharing photos, exchanging tips on steeping certain ones, posting links to articles, and generally spreading the word about tea above and beyond that grocery store kind. There is a vast network of such tea lovers out there. Contrast that with my neighborhood where I get a “You write about what?” kind of stare whenever I tell them what I do with myself all day. One day on Twitter I got into an exchange with someone about tea that started with “So, what kind of tea do you like?” (Sometimes people ask that of me thinking they will get some simple response instead of one that spans several “tweets” – each limited to a mere 140 characters, including the “twittername” of the person I’m responding to.) I started with something simple like “Well, Assam CTC style is my favorite, steeped strong with milk and sweetener.” I think I followed up with “But Darjeeling single estate is also nice, esp. an Autumn Flush.” Then it was “A small pot of green tea can make a nice afternoon transition,” “Some ripe pu-erh is great with steamed pork dumplings, the earthy quality balancing with the lighter flavors,” and so on. He/she replied with a thanks, and I figured I had satisfied his/her curiosity. About a week later, I got a tweet from this person saying, “Your are my tea BFF!” Okay, sounds good. What was that all about? I asked and was told that my tweets about tea had prompted this person to buy and try some of the teas mentioned, and that this experience had opened up a whole new world of tea enjoyment. So, how to be a tea BFF? Be polite and courteous when responding to tea inquiries, no matter how banal or simplistic they may seem to be. Give honest responses that do not give the impression that you are trying to display some kind of superiority (we all thought those grocery store teabags were the epitome of tea enjoyment at one time in our lives). While you don’t want to censor yourself, you do want to word things carefully so as not to discourage a tea newbie from learning more (again thinking back to when you were in that same state). Post some personal tea observations, not just links to articles you’ve written, and include a photo or two when you can. Engage people on social media in a more personal manner, commenting on their posts and even entering in little exchanges such as I showed above. You might even end up sending one of these people some of your leftover tea samples (once I sent someone the one-pound bag of a tea I had bought and then found I didn’t like that well after all – the postage was more than the tea cost – sigh!). You can be a tea BFF in person, too, so look for opportunities to introduce tea to friends, family, co-workers, etc. (bring your steeped tea in to the office, for example, and invite someone to try it). No big mystery here after all. Just good socializing about tea!